Thin is in seems the motto of big companies these. While we saw the thinnest tablet ad the thinnest smartphone at this year’s CES. So, how could Apple resist being smitten by the thinness bug? The company, whose iPhone was once world’s thinnest device it seems, is getting ready o claim its title again. And Apple, being Apple, is taking it from the ground up. Apple has applied for a patent that reveals that its next generation of batteries would not only be thinner, but unlike most batteries, they would be shaped according to the device they fit in. 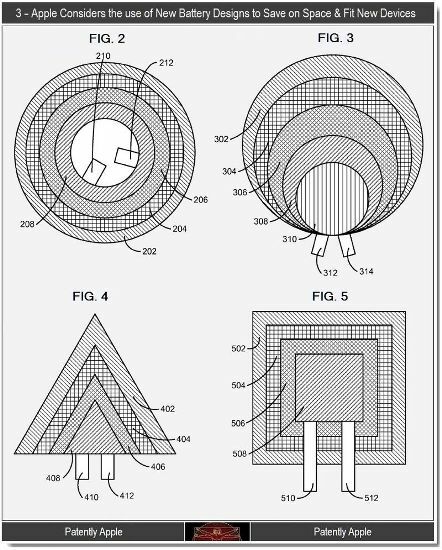 Not only rectangular, but Apple might opt for circular, square and even triangular batteries in its coming devices. The new designs allow Apple engineers to stuff as much battery inside a device as possible. But it’ll also mean that it will become more difficult to replace your battery, besides the thinness will also mean that your battery would be delicate, resulting in possible harm to you or your phone. While the concept has us totally hooked, what remains to be seen is how Apple goes about it and comes up with something that is not only thin and long lasting, but also supports LTE, a feature lacking in their current devices.